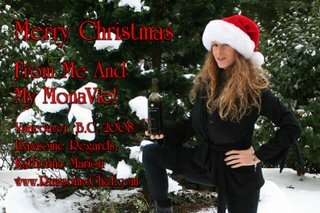 Merry Xmas 2008 from Me and My MonaVie! Vancouver's first snowfall of the sumptuous season. I am all too ready to bravely enter our snowy winter wonderland, after shooting my mouth-watering morning 2 oz of this 'one and only' delicious non-alcoholic acai berry superfood beverage. Enzymatically active, phytonutrient-rich, naturally sweetened with 18 other exotic fruits, and filling the imbiber with a magical myriad of sun-energized ingredients that only a Goddess-sent gift such as this could offer. Give yourself, your clients, friends, and loved ones the most pleasant present worth opening .... Over and over, again! MonaVie Active is the "hot off the pure and precious press'" drink that offers you a natural high. No bubbles, bloating, or helpless hangover. You are in control of your health, healing and happiness; as you enter into a new and delectable dimension, not to mention; highest intentions for your brave New Year. This advanced formula of plant- derived glucosamine is full of beautifying benefits. Get rid of joint pains and aches. Fill up on fiber-filled sterols, resveratrol, and Omega 3 fatty acids. Clear your arteries, clean up your skin, and reverse aging - the rawstruck way. What else could be better? I have 11 cases of MonaVie Active - 4 bottles per case. Call me and let's set up a private or group demo/tasting just for you and yours. I shall gladly be presenting the perfect present at your upcoming holiday gathering. Go for it! May your stockings be as full as mine! P.S. Now available: $49.00 per beautiful bottle. Or by the consciousness-raising case.